We’re excited to welcome you to our new website. Our goal was simple. We wanted to create a website that showcases the work we’ve done with clients, clearly explain our services and introduce people to our team. Our main goal was to create a digital representation of our brand that connects us to both current and prospective clients. We’ve worked hard to create a website full of resources to aid in your digital marketing efforts. For twelve years we’ve been privileged to help businesses throughout Markham, Toronto and surrounding areas exceed with their online marketing needs. Creating long-term relationships with clients has always been the Insiteful Solutions way. A lot changes in the digital landscape, but we pride ourselves on our innovation. Here’s some of the emerging technologies we work with daily. WordPress Development – In the beginning WordPress was tool for blogging. It has now grown into the Internet’s most versatile content management system (CMS). 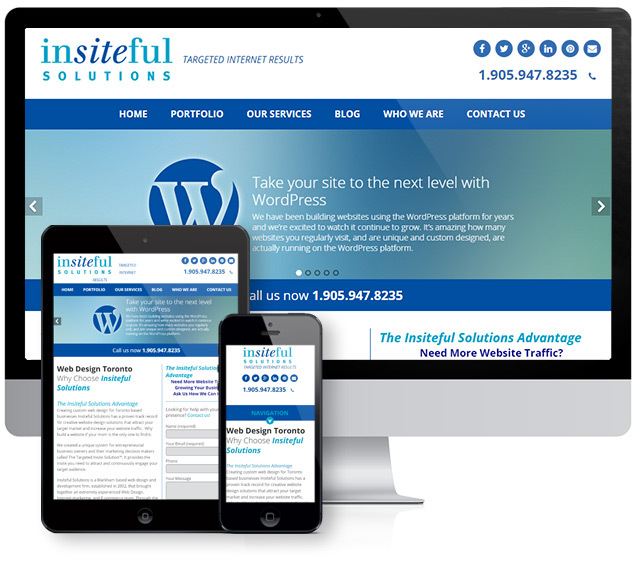 It’s estimated that 22.5 % of today’s website’s are powered by WordPress. The WordPress community is always growing, and there are over 31,000 WordPress plugins available which add an almost endless amount of tools and resources. The platform allows people of all expertise the ability to quickly add and modify the content on their site. Generally, WordPress sites will load quickly and look good on mobile devices. For all these reasons WordPress is now being used by large brands such as Disney, Time Magazine, Google, Facebook, CNN, eBay, New York Times, Sony and other well-known companies.Our team specializes on developing custom-built sites with the latest WordPress technology. All of our sites are optimized for mobile viewing and are built to be scalable. Search Engine Optimization (SEO) – In a nutshell SEO is the process of gaining free website traffic from search results from tools such as Google, Bing and Yahoo!Most Internet users rely on Google as their primary method of navigating the Internet. Search engines list web pages, video, local listings and other content that best matches the user’s search. With a strong SEO plan, your content can appear prominently in these results. A good campaign is rooted in realistic goals and sustainable growth.Our team brings proven SEO methods to your marketing such as content development, clean code, optimized navigation, link building, social media, localization and other proven practices. All of our SEO work is driven by your website’s analytics. Social Media – Social media is one of the most exciting elements in the digital marketing frontier. We’ve learned that marketing on social media does not come in a one-size-fits-all package. We specialize in marketing your brand on all social media tools including Facebook, Twitter, Google+, Pinterest, LinkedIn, YouTube, Instagram, Snapchat, tumblr and more.We specialize in creating both organic and paid campaigns. We believe in creating social media campaigns that connect brands to their online communities. Tools such as Facebook and Twitter can produce newfound exposure which can lead to more web traffic and increased business. Content Marketing – Good online content builds relationships with customers. Strong content can lead to increasing you digital ROI and increase exposure on your brand.We understand that you know your business and market better than anyone. That’s why we take the time to work with our clients to produce memorable and actionable content. Our team specializes in developing content for all mediums including social media, blogs, email, landing page optimization and for all areas of your website.